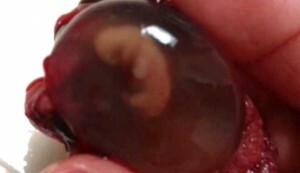 It’s as clear as day that baby David Raphael, miscarried at 7 weeks gestation, is a human being. And when his mother sent her story and a photo of David to Planned Parenthood clinic director-turned-pro-life advocate Abby Johnson, his photo went viral. It’s an amazing image. Baby David in an intact sac, held by his mother. His developing eyes, arms and legs undeniably there, making him undeniably more than a “blob of tissue.” But that’s what many women are told is all they are carrying when they head to the abortion clinic. David’s life can change that. My only prayer when the doctor told me at 11 weeks that my baby had died a month earlier (at 7 weeks gestation), was that I would have something to bury. The doctor said he would either be too small to find or that his fragile body would be crushed in the miscarriage process and there wouldn’t be anything left. On Palm Sunday afternoon he came out. The entire sac was intact and there he was still floating in the amniotic water. I took a picture so I wouldn’t forget that moment and how God answered my prayer. I think it would be an amazing photo to show people contemplating abortion. The photo, which Johnson posted on her Facebook page, has received over half a million likes and been shared nearly 175,000 times. And while abortion supporters are responding by calling the photo of David “gross” and “disgusting,” Johnson notes that if abortion advocates don’t think anyone should have to look at a picture of a 7-week-old preborn baby, they should be concerned about the abortion workers who look at babies like that every single day after ending their lives.